The SimLean Handbook provides guidance on how to run SimLean during an improvement event. The handbook is intended for training purposes, to illustrate through the use of simulation and step by step analysis, the principles of Lean. We use the term 'facilitator' throughout the handbook in reference to the person who is delivering the training and the term 'participants' is used in reference to the receivers of the training. In addition the document is also useful for independent study and reference. An online version of the handbook can be found at the SimLean website www.simlean.org and this guide can also be downloaded from the 'downloads' section of the site along with other supporting materials, including sets of slides and accompanying simulation models. The authors would like to acknowledge the support provided by the Warwick IMRC under grant number R.IBOP.9229+R.ESWM.9229+R.MHPC.9229: ‘SLIM’ that allowed us to do the basic research, design and then trial the SimLean concepts in a range of NHS hospital trusts. Thanks also to the generosity of NHS hospital Trusts and staff up and down the country who contributed greatly to the development of SimLean. We would especially like to thank Professor Ruth Davies for her contribution in the early stages of this project. We would also like to thank all of those from within the NHS, up and down the country who helped us in developing SimLean. We cannot mention you all by name but you know who you are. SimLean is based at the University of Warwick. Why Should You Use SimLean? It is sometimes said that making improvements in a hospital environment is like 'fixing the aeroplane whilst it's flying', it's not ideal but it is often the reality! SimLean allows you to experiment with making changes to your process in a computer environment and view the impact of these changes on patient flow without disrupting the workplace and patient safety. Put simply, SimLean gives you confidence to carry forward your experiments into the workplace. SimLean is a combination of simulation and Lean. To help you understand what SimLean is, and why it works, it may be helpful first to clarify what 'simulation' is and what the Lean approach to improvement is. Simulation: this refers to the creation of a simplified imitation of a hospital process using hospital data to animate the movement of patients and resources through a system. 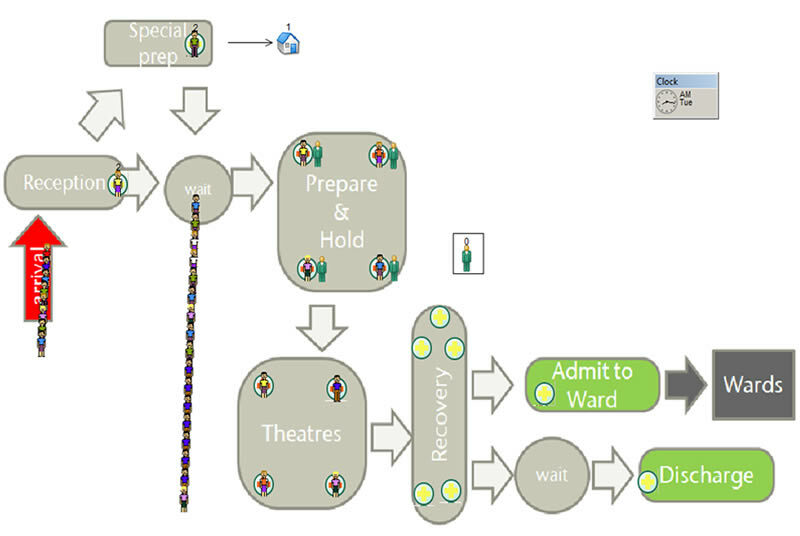 SimLean uses computer software to recreate the process (often by inputting information from a process map) and to input data relating to patient arrival and patient flow. "a philosophy, which aims to develop good practice of process/ operations improvement that allows a reduction of waste, improvement of flow and better concept of customer and process view through a culture of continuous improvement involving everyone." In practice we know that the approach to Lean differs from one hospital to another, ranging in focus from waste reduction and housekeeping techniques (5S/6S) to wider Lean projects, programmes and even an organisation-wide Lean strategy. All too often it can be hard to leverage Lean into organisation-wide strategy as the benefits of Lean can often be intangible, for example increased staff morale due to a reduction in chaos, duplication, and process steps. SimLean has the potential to demonstrate visually the impact of changes to process configuration on patient flow and resource usage. Furthermore, what simulation brings to Lean is the ability to experiment rapidly with the process in a simulated environment, from a small simple change to a radical redesign of the process. It may be that you can challenge the present wisdom on how best to manage patient flow and deliver better value to patients and staff using SimLean to indicate the likely impact of a process change. SimLean has been shown to support and extend the impact of rapid improvement events in healthcare . SimLean is designed to be used in three ways: to educate, to facilitate and to evaluate as shown in the following diagram. The first way is to educate staff in the key principles of Lean such as 'value' and 'flow' by using simulation models to demonstrate the impact of common practice in healthcare; second to facilitate experimentation with the process under study, to consider 'what if' (for example, what if we merge two processes together? What would be the impact on patient waiting times?). Finally, a third use of SimLean is to evaluate the impact of a process change in considerable detail, often taking many weeks and sometimes months of an experienced modellers time. This third way is a more traditional approach to simulation, occurring after a Lean improvement event or project. Put simply, SimLean Educate is designed to be used prior to an improvement event/project as part of a separate training exercise or as an introduction during improvement activity; SimLean Facilitate is designed to be integral to an improvement event and SimLean Evaluate is to be used after the improvement event to examine in more detail the likely impact of a process change through the development of a more detailed model. We suggest you start with SimLean Educate. The objective is to educate improvement event participants in the principles of Lean, and encourage them to reflect upon existing practice. SimLean Educate employs a model of a generalised process to engage staff in thinking about the similarities between the generalised process and their own system. Typically, there are many similarities as the majority of hospital processes actually share a common process structure. The anticipated outcome of SimLean Educate is that staff are inspired to challenge the way they work. SimLean Educate focuses on patient flow using key introductory examples to illustrate how patients move through a process under different process conditions. 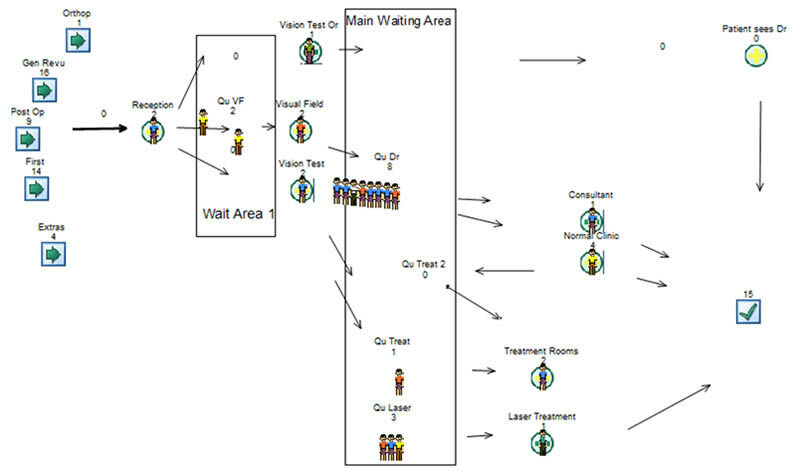 For example, Figure 2 shows a screen shot of patients queuing when they arrive in groups, what we call a batching process. This visual representation has been shown to be particularly useful in encouraging critical reflection around the conceived notion of how patients flow through a process. In addition to the standard SimLean Educate package, a number of interludes allow you to tailor Educate to the specific needs of your participants. Our selection of key 'educational interludes' present specific lessons around common issues; for example, the impact on waiting times of prioritising some patients over others; this demonstrates that whilst some patients (those who are prioritised) will benefit, others will see their waiting times increase significantly – thus encouraging critical reflection on these issues to make better informed judgements about process change. Each of the three interludes identified below and presented in this handbook are tied directly to Lean principles. Level the Load – demonstrates how a small change to the process of patient arrivals in the form of reduced batch sizes has a positive impact on patient flow. Balancing Flow – demonstrates how prioritising certain patients can negatively impact the effectiveness of the whole system with non-prioritised patients experiencing reduced patient value as they are have to wait considerably. The objective is to encourage participants to identify the need to balance the system when prioritising patients. Focus on Value – demonstrates how reduced resource availability as a result of clinical staff being unavailable in some way can have a significant impact on patient flow and patient value. Once you have become familiar with SimLean Educate, or if you already have some experience with simulation, you may want to try using SimLean Facilitate. The main aim of SimLean Facilitate is to help people engage, interact, and experiment with their process in a simulated environment in order to explore the impact of process changes without having to disrupt the day to day work of others. SimLean Facilitate allows users to build a model of their own process, or the process under study and interact with the model to experiment with different process configurations. SimLean Facilitate works by transferring the information presented in a process map (typically created with traditional brown paper/post-it note as part of an improvement event) into simulation software (such as SIMUL8). The facilitator can then input data to bring the process to life and share this with the team. Although data gathering and input is very important it should not be an arduous task. Our experience is that it is better to use data collected by workshop participants that reflects what is considered to be the best, worst, and average times taken to complete each task rather than over-complicate this with complex analysis. Using this data, SimLean Facilitate brings a typical post-it note process map to life using data about patient flow to make the map both dynamic and interactive, see Figure 3a and 3b. As well as animation, the simulation model provides the ability to quickly access key performance data at all points of the process. Figure 4 illustrates the vast quantity of results available and the user is able to tailor the presentation style and which bits of data to look at. Try not to be put off by the scale of data you can access, only use what is relevant and useful. From this point, the simulated process map becomes an interactive tool for experimenting with new ideas for improving your process and the data can be used to indicate whether the change will have the desired effect. This is particularly useful when it comes to getting buy-in from others! We should emphasise that SimLean Facilitate is designed to 'indicate' the probable impact of a process change. To build a model with absolute data would take several weeks perhaps months of a professional modeller's time. The advantage of SimLean Facilitate is the relative speed in which a model can be built to indicate the likely impact of a change based on the knowledge of the people who work in the process itself. SimLean Facilitate requires simulation software and the support of someone with simulation and modelling skills. We have used SIMUL8 software and it may be that there is someone from your Lean team, if you have one, service improvement team or an external provider who is able to help you with this. Finally, we emphasise that SimLean Facilitate is intended to 'indicate' whether or not a process change will have a desired impact. It is not meant for detailed, rigorous analysis, for this we suggest SimLean Evaluate. 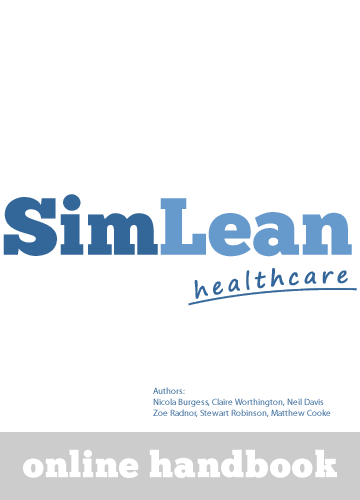 SimLean Evaluate is our term for the development of a more traditional model using a high level of detailed hospital data to fully evaluate improvements and give full confidence in a process change. For this you should contact a simulation specialist in either your own organisation or in the wider support community. The next two sections guide you through SimLean Educate and SimLean Facilitate in more detail. SimLean Educate is designed to help educate your team in general lessons about process design. For example, the impact of batching patient arrivals upon the flow of patients through the process, the impact of prioritising certain patients or the impact of pooling resources vs. dedicating resources. 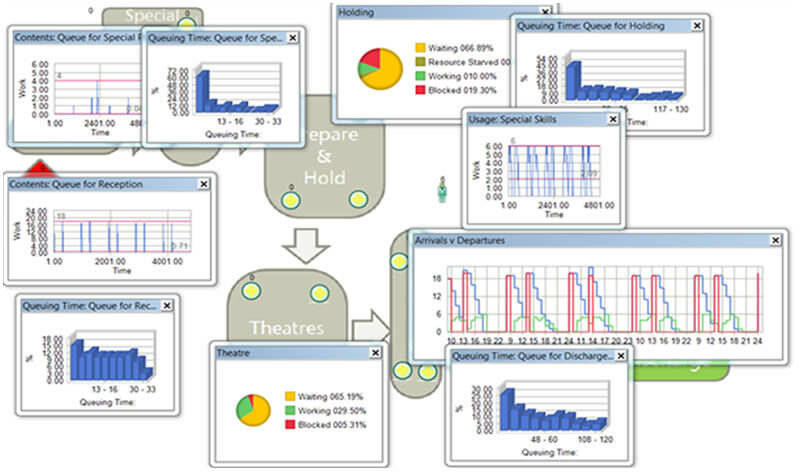 SimLean Facilitate engages the skill of a modeller to convert a process map into a computational model that can be used to experiment and 'indicate' the performance of different versions or alternatives of the process and its resources. For example, the user can change the quantity of staff in the process, the quantity of beds or theatres, the process layout, the priority order of patient groups and even protecting resources for a specific type of patient and so on. SimLean Evaluate develops a detailed simulation model with the full use of hospital data to thoroughly evaluate future options. Fillingham, D. 2007. Can Lean Save Lives. Leadership in Health Services, 20, (4) pp.231-241. Radnor, Z.J., Walley, P, Stephens, A and Bucci, G. (2006), Evaluation of the Lean approach to business management and its use in the public sector, Government Social Research. Spear, S. Bowen, H. K. (1999) Decoding the DNA of the Toyota Production System. Harvard Business Review, 77, (5), pp.96-106. Spear, 2005 S. Spear, Fixing health care from the inside, Harvard Business Review 83 (9) (2005), pp. 78–91. Booked a room with presentation facilities and arranged the refreshments. Before the event: Make sure you have the SimLean Educate PowerPoint presentation available for download from www.simlean.org and select 'downloads' from the navigation bar. Make sure that you are also able to present the SimLean Educate model, you can find the model on our website. Begin the presentation. Your opening slide is an opportunity to talk a little about what SimLean Educate is, i.e. a concept that brings together simulation with Lean as described in section 1. Slide 2 (shown) develops the agenda for the session. This is an important first slide that provides a gentle introduction to the common forms of process behaviour that we aim to challenge. 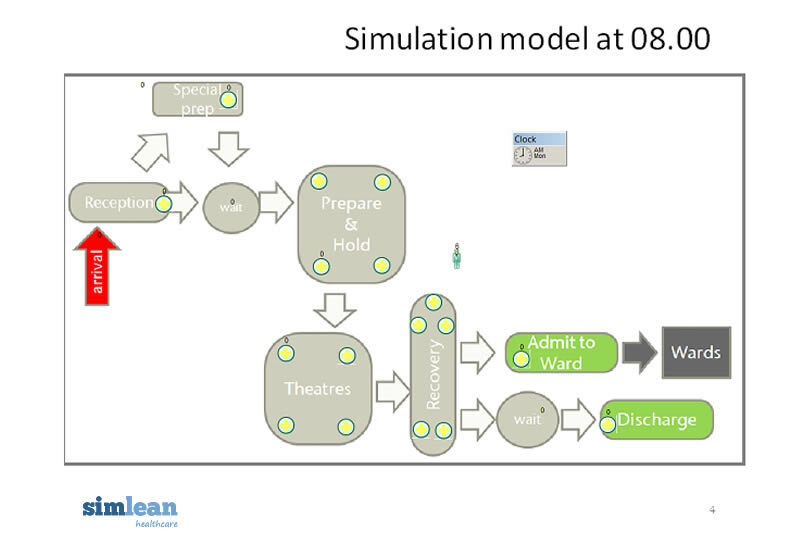 Next, slides 4 and 5 provide a gentle introduction to the simulation of a generalised theatre process. We recommend that this simple process flow diagram is used to 'walk' participants through the process. For example you might explain the process steps one by one: all patients arrive at reception, check in and wait. Some patients may then move to 'special preparation', eg. blood tests, ECG, nebuliser etc, before waiting for the next process step (and some may be sent home at this stage (too ill for surgery) and others will move to a waiting area). The next step in the process is for the patient to move into the 'holding bay' where they are prepped ready for surgery. 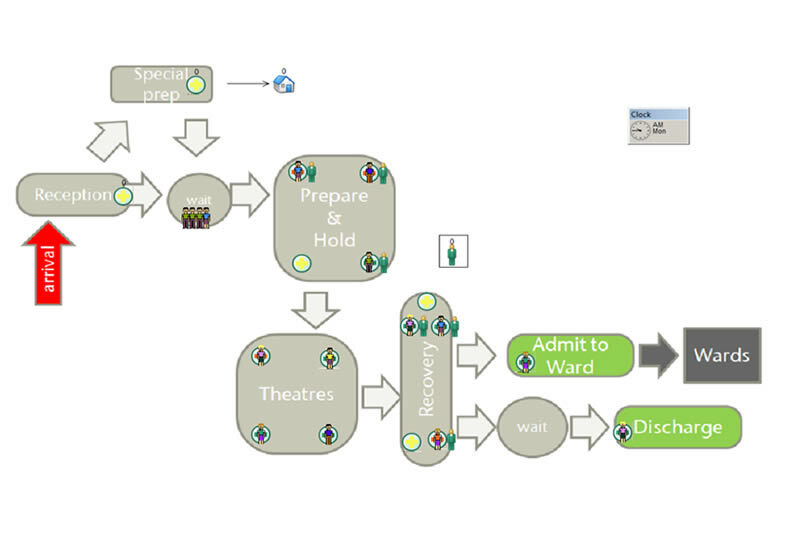 Patients then move from the Holding bay to theatre and then from theatre to recovery and back onto wards or discharge. Having slowly walked participants through the process it is anticipated that many will be able to see the similarities of this process with their own, for example, in an ophthalmology clinic the patient is admitted – waits – has a visual acuity check – waits – has visual fields – waits – sees doctor – and then is either discharged or waits to be admitted/receive further treatment. Participants should be encouraged to reflect on the similarities and differences between this simple generalised process and their own but try to steer participants to the conclusion that the sequential nature of the process is common to many hospital processes, even an accident and emergency department. Slide 5 replicates the model shown in slide 4 but highlights the symbols used and their meaning. Queues of patients should be fairly obvious to all, other things to pick up are identified clearly on the slide. As the model runs it gathers information about the sizes of queues, the utilisation of resources and the number of activities performed. Non-Lean practices often produce surges in activity and large queues. The model shows large queues of people at various parts of the process and at various parts of the day. First reception is overloaded, next it is the waiting room then holding bay becomes full (notice the red crosses), theatres and recovery become blocked and patients experience excess waiting. It may be worth reflecting on similarities in their own process, for example: Where do problems occur? Why? Is it similar to the model? A word about data: It may be worth noting at this point that the data used to simulate patient flow is based on real hospital data where patients arrive in two batches at 8am and 1pm and incorporates natural variation such as surgery that takes longer than expected due to complications and patients who are unfit for surgery and are therefore returned home. Why is the waiting room full? Why are the appointments running behind? Why did the doctor arrive late? Why is the car park full? One somewhat provocative but thought provoking discussion can be had here that centres thinking around what is value, and gently encourages people to begin to challenge the process steps. Often having patients arrive in batches is perceived to be the most efficient way of running our processes – but who benefits from this practice? The patients have to wait (waste); some members of staff will have to bear an increased burden directly related to the fact that patients are waiting (waste). The only real value attributable to waiting is that the patients are indeed, ready and waiting! So the nurse/doctor/consultant/surgeon can call them through when they are ready to receive them. The objective of these slides is to steer the discussion towards value. Value should be discussed from the perspective of the patient and the staff. With regards to waiting, there is clearly no value to the patient, in addition, the more people waiting the more time spent by staff attending to them, often leading to frustration for everyone involved. Many hospital processes are designed around a 'batched' patient arrival system i.e. multiple patients are given the same appointment slot and are 'stored' in waiting rooms until it gets to their turn. SLIDE 10 - DO YOUR APPOINTMENTS MATCH YOUR PROCESS? Slide 10 illustrates batches of 18 to 20 patients arriving twice daily. In theatres this is very common practice for various pragmatic reasons that are well guarded by surgeons. In other areas of the hospital and other processes the batching of patients may be more implicit, for example, numbers of patients congregate in batches waiting for blood tests, x-rays or nurse led treatments or waiting to be discharged for example. Often we view waiting in hospitals as the norm and indeed our hospitals are set up to cater for this very purpose. Slide 11 demonstrates that whilst the admission to the process is batched, discharge is not. From the patients' point of view the situation can be quite frustrating and stressful. The simulation can help us see and understand that although this can be quite good for those who are seen first, many patients end up waiting for a long time. In the Patients Leaving chart (slide 11) we can see that the activity rate is quite constant. There is some variation as we expect but patients tend to be seen and discharged at fairly constant intervals. Nevertheless, some of those who are asked to attend at 08:00 are not actually seen until mid-day. Not only the patients but also the staff may have to wait beyond their planned working time to get everything done, and sometimes the morning activity interrupts or delays the afternoon activity. We advise that participants are encouraged to engage with these charts. As facilitator you might ask: Does this sound familiar? Does the batching of patients' appointments really help them? Does it even really help the clinical staff? (Or does it just add to the level of confusion, making everyone's life harder; doctors, nurses, managers and patients?). The goal we are working towards is to enable people to challenge the process in order to deliver value with less waste. 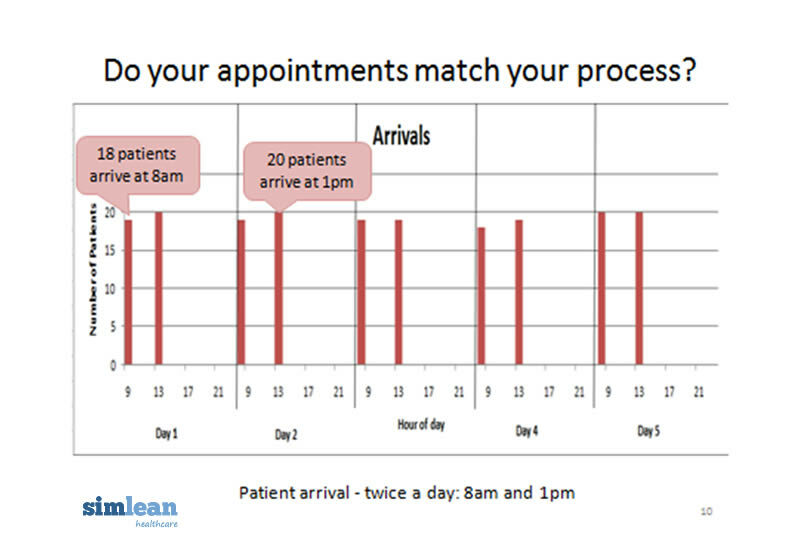 Slide 12 continues to develop this picture of patient flow by looking specifically at the number of patients in the process throughout the day. The concept we try to get across here is that the number of patients entering the process should be equal to or less than the number leaving. If this condition is not fulfilled then queues will form. We use slides 10 to 12 to try and get this intricate message across. The graph clearly shows that there are patients still in the system when the afternoon patients arrive.. It is useful at this point to remind participants that Lean is about working towards an ideal system where value flows at every step, thus no patient is kept waiting and length of stay is only as long as necessary (value-adding). We recommend participants are encouraged to reflect on what an ideal picture of patient flow might look like. SLIDE 14 - A VALUABLE SERVICE OF A WASTE OF TIME? 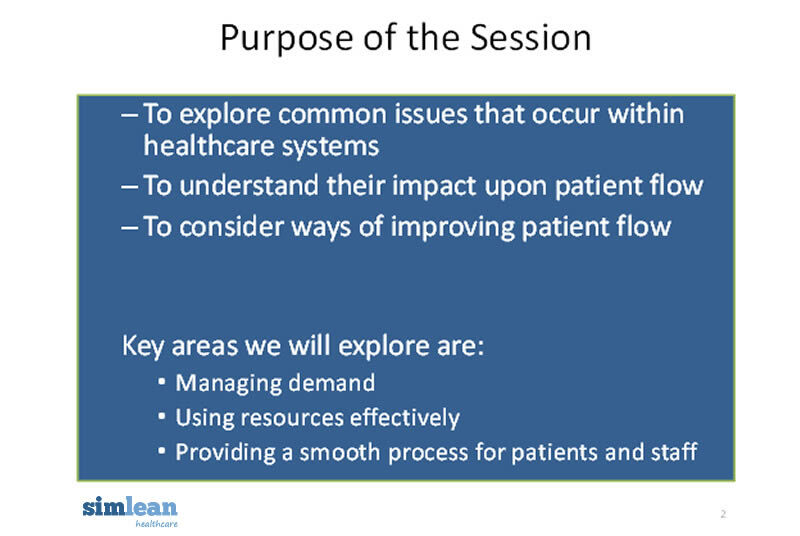 Next we consider the process from the patient's perspective – how much time do the patients spend in the process. This last chart (Slide 14) shows that many patients spend as much time (if not more time) waiting than being seen to. The green in the chart shows patients receiving what they came for; the yellow identifies a 'wait' and the red represents a 'block' (an example of a 'block' might be where the patient is ready, the surgeons are also ready but are unable to transfer the previous patient out of theatre because the recovery room is full). Note that the patient will not be aware of the block, thus the block constitutes a wait for the patient. In the example, we can see that the first patient has a good experience, they are seen immediately, treated and discharged, but patient 2 experiences a wait of around 20 mins and the wait time for each patient generally escalates throughout the morning. Patient number 19 waits a total of 240 minutes. The final point of interaction asks participants 'how much extra effort does a blocked patient require?' Long waits and blockages often places extra pressure on clinical staff as they are having to stay with the patient for longer, go back and check on the patient more often, answer more queries, take more questions and work longer. Considered how 'batched' arrivals of patients impact upon patient flow. The concluding slides of SimLean Educate summarise the common problems that arise in a majority of health care organisations, alongside a vision for removing waste (waiting, duplication, over-processing, over-production, excess motion and transport and poor quality); stabilising the process; and avoiding overloading our staff. The final slide refers to ideas for improving the process which are based on separate 'educational interludes' to be used in conjunction with SimLean Educate either immediately after the main set of slides or used as and when the facilitator feels they may add insight to the improvement agenda. Grouping patient arrivals together, (what we call 'batching'), is common practice, particularly in theatres and indeed in clinics. Furthermore, batching often occurs throughout a patient's pathway with respect to the various functions that all play a part in providing patients with diagnostics, treatment and care eg. blood tests, x-rays, writing up patient notes etc. We note that the reasons for batching are well guarded by health care professionals. By running the model, participants should immediately see the difference in the length of the queues. The slides that follow facilitate an examination of the whole process under '6 batch' and compares this to '2 batch'. What becomes clear is that a small change in the arrival pattern increases value to the patient and reduces the burden on staff whilst the treatment time remains the same. Slides 2, 3 and 4 are reminders of what the process looks like under '2 batch' conditions, i.e. patients arrive at 8am and 1pm. Slide 2 incorporates a 'run' button so that you can run the model which is identical to the one that forms part of the SimLean Educate slides. Slide 3 presents a 'picture' of patient flow that participants should now be familiar with. Slide 4 reminds us about the patient experience and provokes a discussion around value (see step by step guide for discussion p.23). 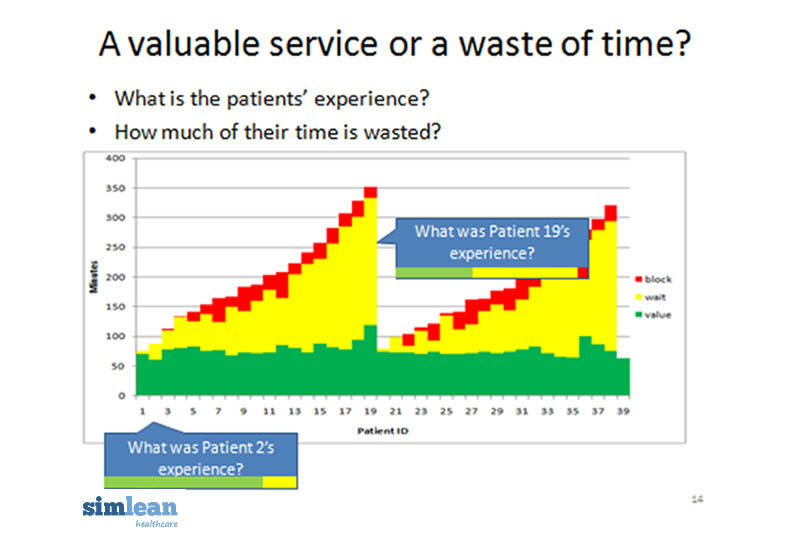 Slide 5 (shown left) breaks down the patient experience to analyse where the patients queue. The graphs tell us that at reception, the average patient queues for 14 minutes. However this varies with 15% of patients waiting less than 3 minutes and 30% of patients over 20 minutes, and some slightly more. In the holding bay we can see that 30% wait 3 minutes or less but most wait over 20 minutes and some patients are waiting for 2 hours. In discharge we see that the average time to discharge is 46 minutes but some patients wait more than 2 hours. 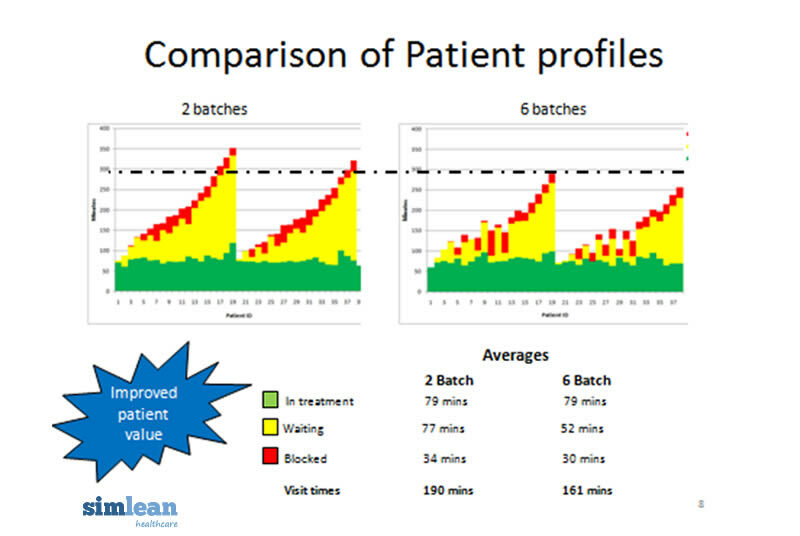 These graphs clearly show wide variation in patient care under the 2 batch system. We know that persuading people to challenge the way they work is a difficult task, and the prospect of change can be daunting. Slide 6 is designed to gently introduce the idea of dividing patient arrivals into 3 smaller batches across a time period of 1.5 hours rather than all patients arriving at once. The same idea is also applied to the afternoon patients thereby creating 6 smaller batches of patients across two time intervals: 8-9.30am and 1-2.30pm. Once explained to participants, the facilitator should locate the 'run' button on slide 6 and run the new model to demonstrate the process under 6 Batch conditions. Participants should immediately notice that the queues are much smaller because there are fewer patients entering the department all at once. Slides 7-11 now look at the data produced by the simulation model to compare patient flow under both 2 batch and 6 batch conditions. 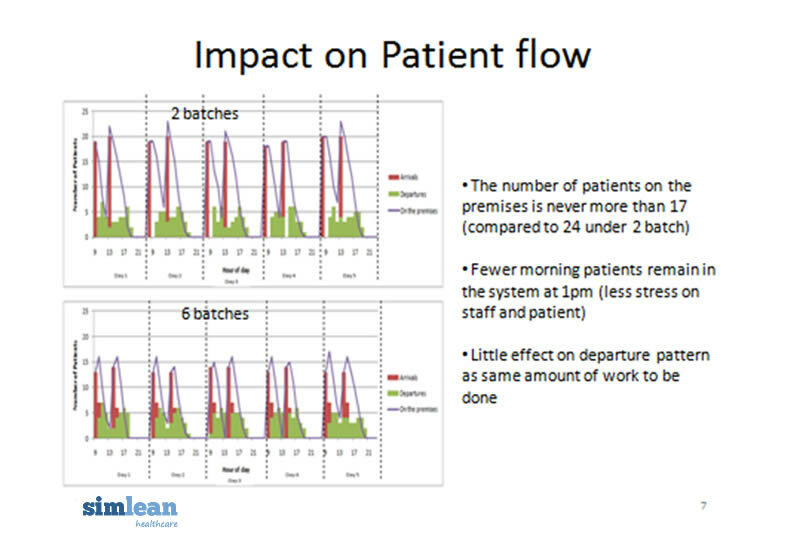 Slide 7 demonstrates the impact of reduced batch sizes upon patient flow. Under 6 batch conditions there are never more than 17 patients on the premises (waiting to be treated) compared to a maximum of 24 under the 2 batch process. What impact does this have upon staff? One would expect that staff are better able to cope and care for 17 patients awaiting treatment than they are 24. Other impacts identified on the slide include the fact that there are fewer patients remaining in the system when the afternoon batch arrives. Again, you might ask: what impact does this have on staff/patients? The final point to make here is the rate of departure. Given that the only process change is the rate of arrival, the rate of departure does not change at all. This is because the time spent treating the patient remains the same. Slide 8 (above) compares the patient profile under both process conditions (2 batch and 6 batch) in order to draw out exactly where patients are benefitting from a reduction in their waiting times, i.e. a reduction in process waste. Confirmation that patients spend the same amount of time in treatment but spend considerably less time waiting/blocked shaving nearly 30 minutes off the average patient visit, thereby improving value from the perspective of the patient and reducing burden on staff as a result of patients waiting less. Slides 9, 10 and 11 now look at the individual functions to see how the process change affects each of them in turn. We recommend that each of these slides are shown briefly with just the key facts highlighted on each slide. Slide 9 illustrates that the average waiting time for patients at reception is reduced by 10 minutes, we have added the pie charts to show that the level of work done by reception remains the same. Slide 10 shows a similar picture of the holding bay where time spent waiting is reduced by 50%, again the benefit to the patient is clear but participants should also consider the benefits to clinical staff looking after the patients as well. 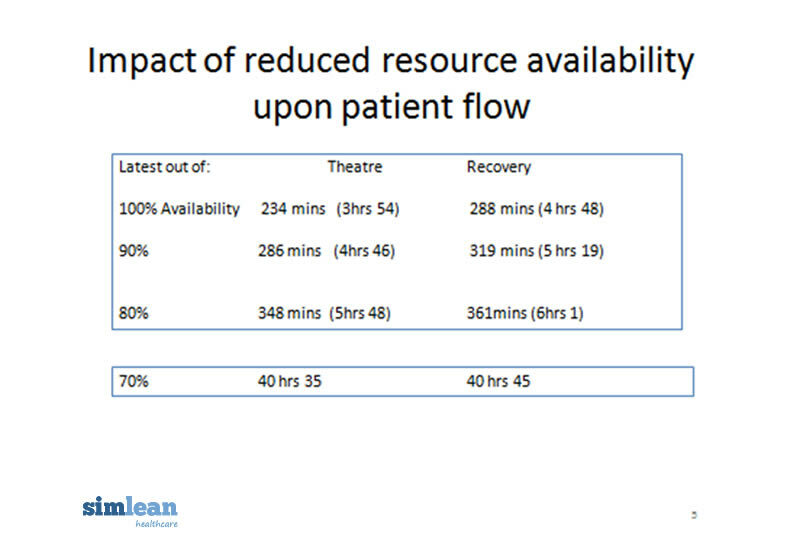 Slide 12, is an important slide illustrating that patient throughput in theatres and recovery has not been affected under the 6 batch process, indeed throughput is likely to be improved due to reduced blockages. In summary, we try to emphasise that the 6 batch process of patient arrival is only a very small change. We have planted a seed for a small change that works in the interests of both patients and staff with minimal disruption. The objective is to enable participants to recognise the benefits of spreading patient arrivals, giving them the confidence to initiate the change. However, we also see that whilst patient waiting is reduced, the benefits of this simple change are more pronounced in reception than they are further along the pathway. This is because whilst the admission process has improved, all other aspects of the patient pathway have not similarly adapted and thus the improvements are far less pronounced. As a final question, you might ask: Does the move to 6 batch go far enough? And: What more could we do? Frequently certain patient groups will be given priority over others. There are many good reasons for prioritising patients often based on clinical needs, but other reasons may include the needs and resources of the department. Interlude 2 illustrates the impact of prioritising patients upon patient flow. The accompanying model prioritises patients in pale coloured shirts, (i.e. white or yellow) over patients wearing dark shirts (eg green). By running the model we can see how the system as a whole behaves under these conditions; the results can be compared to the original 2 batch model used in SimLean Educate and Interlude 1. 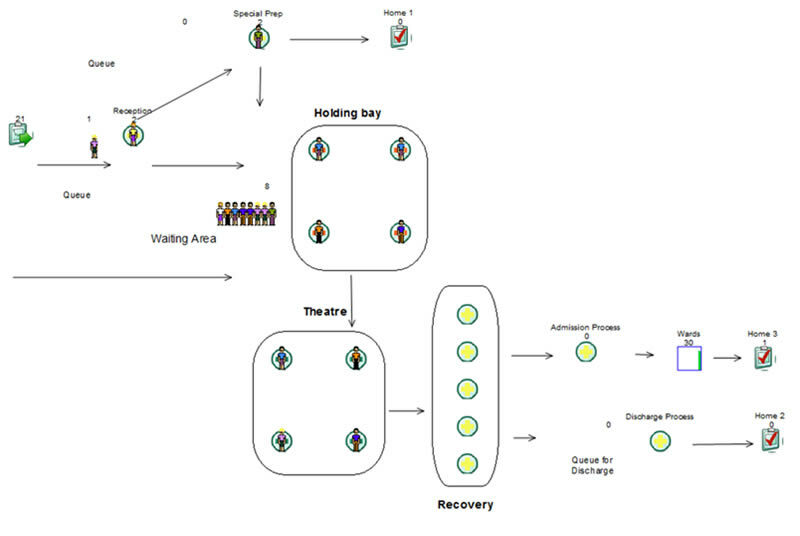 By running the model, participants should see that queues are forming in different places, with more blocking occurring in the 'holding bays', theatres and recovery. This occurs because priority patients have effectively been pushed to the front of the queue, they have gone through so quickly that the admission process cannot keep up. 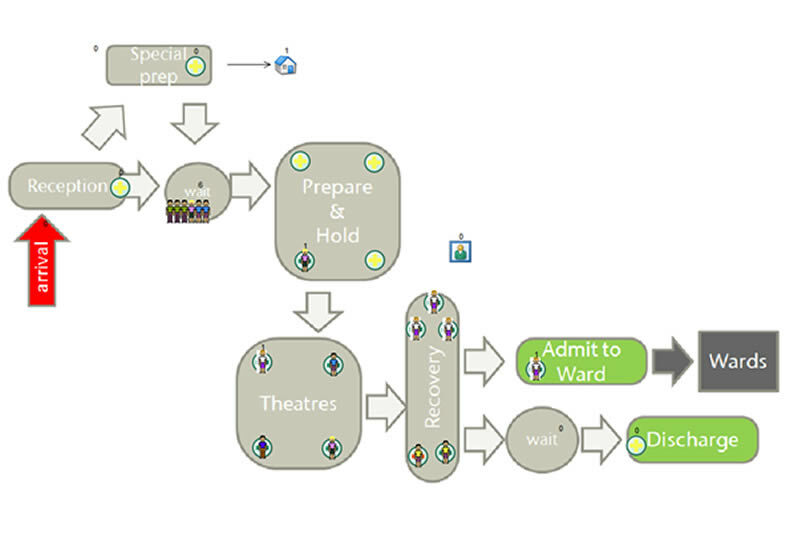 Thus the 'rhythm' of the whole process is set by the most congested stage, in this case the admissions to the ward for priority patients following surgery – rather than the most important. The message here is that if you are going to operate a 'priority' system you need to make sure you have sufficient resources to cope at every stage of the process. The slides that follow demonstrate that whilst 'prioritised' patients have greatly improved throughput times, non-prioritised patients are considerably worse off. Ultimately, non-prioritised patients experience far greater waiting times under the 'priority' process, and staff are finishing later. The underlying principle of Lean that is being demonstrated here is that of 'balancing flow'; participants should conclude that the prioritised system leads to a surge in demand further along the pathway and that this process is not set up to cope with this demand. 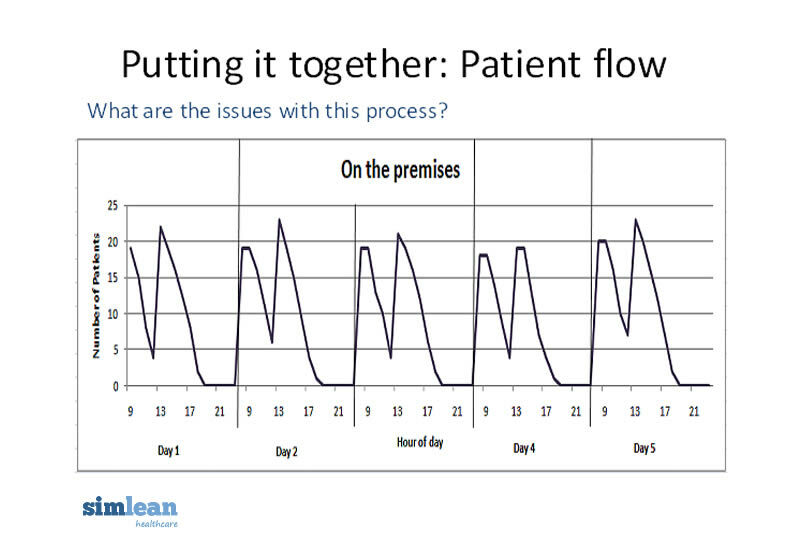 Slide 3 presents a 'picture' of patient flow that participants should now be familiar with. 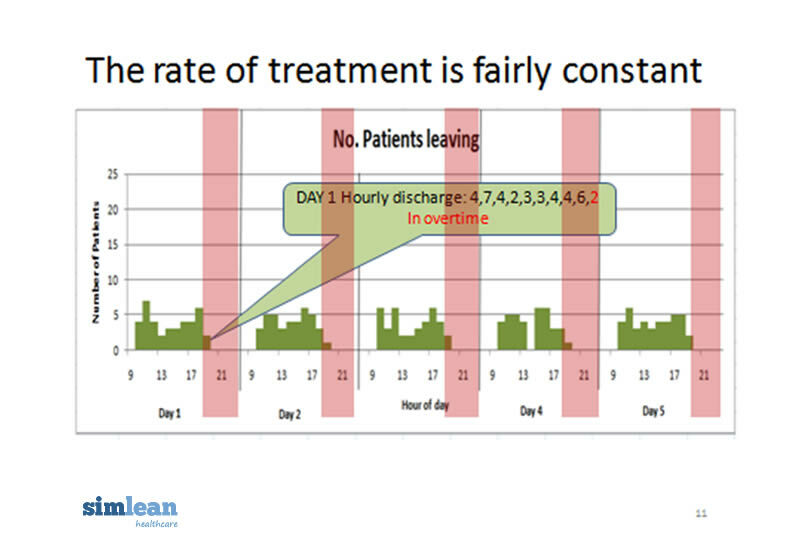 As a reminder, the red bars represent patients arriving in large batches twice daily, the green bars show that patients leave the process at various times throughout the day. The purple presents the number of patients on the premises per hour of the day, and frequently some patients will remain in the process when the second batch of patients arrives. Slide 4 reminds us about the patient experience and provokes a discussion around value (see step by step guide for discussion). Slide 5 is a more detailed discussion relating to where patients are queueing in the process as discussed in Interlude 1. Prioritisation of patients can occur for all sorts of reasons relating mainly to clinical need and patient care but also due to local and wider pressures. Slide 6 invites participants to view patient flow under a 'prioritised' system. 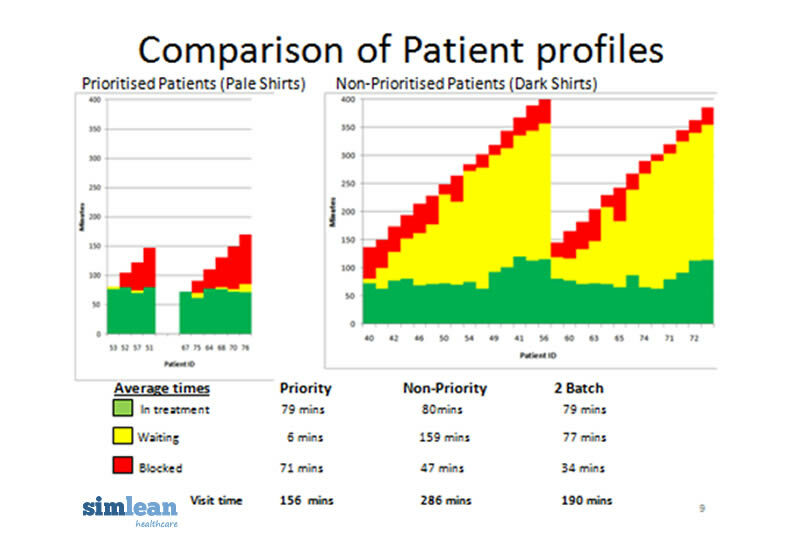 Prioritised patients are visually identified by the colour of their shirts: pale shirts (white and yellow) are prioritised patients and dark shirts (green and blue) are not prioritised. The following screenshot of the model indicate the blockages in the system under the prioritised system. Figure 5 shows a number of white and yellow shirts in the recovery ward that have not yet been admitted to the wards/discharged. At the time this screen shot was captured, the patient in the bottom left bed of the recovery ward is ready to move but is unable to. Consequently, theatres are about to become blocked as there are no beds available in recovery. Hopefully, participants will have noticed that the flow of patients through the prioritised system differs from that under the 2 batch system. The next step is to use the data from the simulation model to examine whether the system performs better under priortised conditions than under the basic 2 batch model. 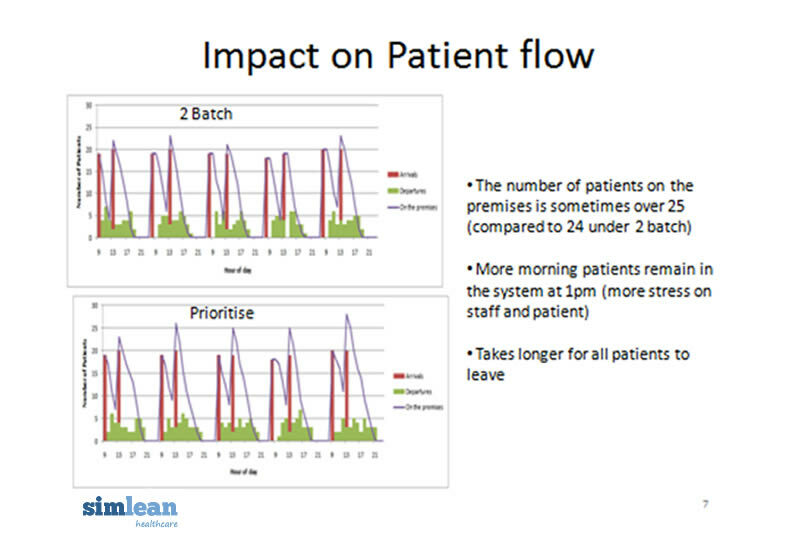 Slide 7 shows compares patient flow under the prioritise system with patient flow under the 2 batch system. From the two graphs it is clear that the number of patients on the premises has now increased, there are more morning patients left over in the system at the start of the afternoon creating more stress for staff and patients, and it takes longer for all patients to leave (the last patients leave the process after 9pm/21.00). So the model suggests that patient flow has actually become more sluggish under the prioritised system. What about patient waiting times? Slide 8 compares the patient profiles under both systems. We can see that the time spent treating patients remains the same but the red area has significantly increased, particularly for the first patients that enter the process (i.e. the prioritised patients). It seems that although the first patients to enter appear to experience less waiting (in tandem with the 2 batch system), in fact they are now experiencing 'blockage'. Patients experience blocked periods as a 'wait' and thus patient value is actually reduced for prioritised patients. Indeed, the average values for time to treat, time spent waiting and time spent blocked are each greater under the prioritised system with an increase in the average overall visit time of 52 minutes. Slide 9 takes a closer look at patient profiles, this time comparing the profile of prioritised patients with that of non-prioritised patients. We can see that the average time spent waiting by prioritised patients is far less than the average time of the non-priority patients and also considerably less than the average time under the 2 batch process. This is a good outcome for patients who are prioritised. Unfortunately these patients are experiencing blockages created by the very fact that they have been prioritised, in other words they jumped to the front of the queue only to wait at a later stage. A discussion could be held as to why the prioritised patients are now experiencing the blocks. 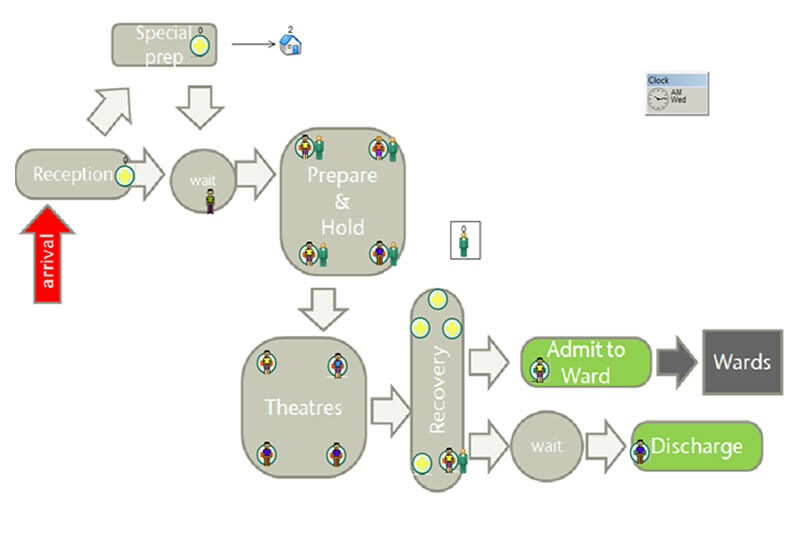 In this example, the model is based on the assumption that patients who are prioritised according to their clinical need require admitting to the wards following surgery, and this creates a surge of activity for the admissions process creating queues. The block at the admissions process has a knock on effect across the patient pathway, causing recovery to become blocked (as they can't move patients out); theatres then become blocked; the holding bay becomes blocked and so on. Participants should also consider how to avoid this blocking, for example by balancing the systems resources. 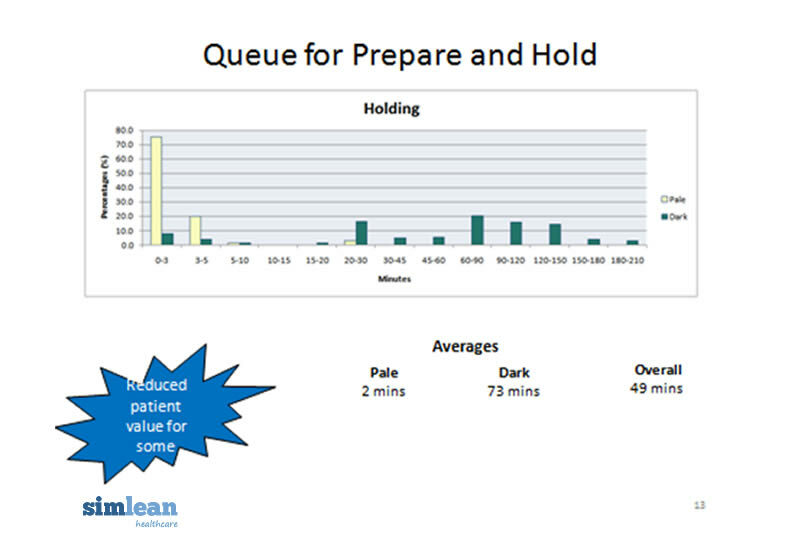 Despite the increased blocking, prioritised patients are considerably better off under the prioritised system: the slide shows that the average wait time of prioritised patients is just 6 minutes, compared to 77 minutes under the basic 2 batch system. But what impact does this have on non-prioritised patients? Non prioritised patients are considerably worse off under the prioritised system. The average wait for non-prioritised patients is 286 minutes compared to 190, an increase of 96 minutes. Slides 10-15 explore where waiting occurs in the system. In slide 10 waiting at reception is identical to wait times under the 2 batch system, there appears to be no change. This is because there has been no change in the arrival pattern, patients are still arriving in 2 batches. Slide 11 splits the prioritised system into wait times for prioritised and non-prioritised patients. Here we can see that although average wait times have remained the same, prioritised patients have a better overall experience but waiting has increased for all non-prioritised patients. The facilitator might ask: What could be done to avoid this? For example, can prioritised patients arrive at a different time to non-prioritised patients? Would this help to balance the flow of patients in the system? 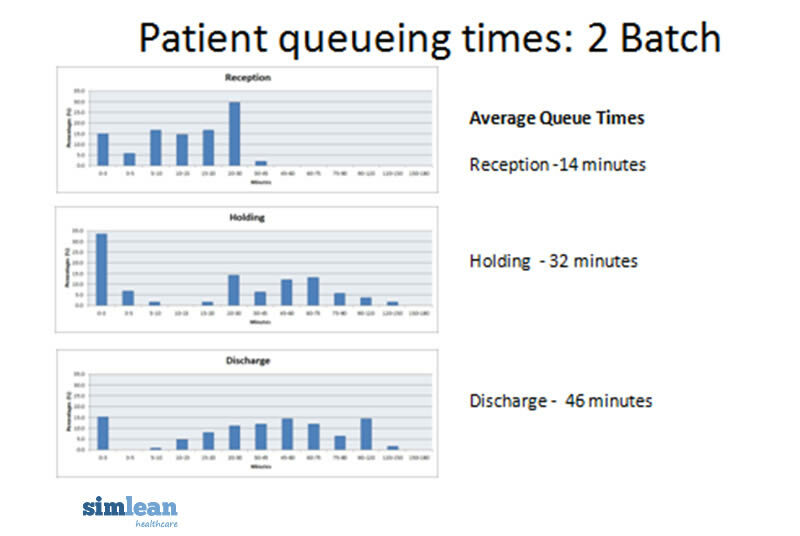 Slide 12 shows that more patients are waiting longer for the holding bay. Slide 13 (above) splits the patients into prioritised and non prioritised patients to reveal that all of the excess wait times are experienced by the non-prioritised patients. Notice the stark difference in the average wait times: 2 minutes for prioritised patients versus 73 minutes for non-prioritised. Slide 14 considers the queue for discharge. Only non-prioritised patients are discharged. The average time for discharge under the prioritised system has increased from 46 minutes under 2 batch system to 65 minutes under the prioritised system. 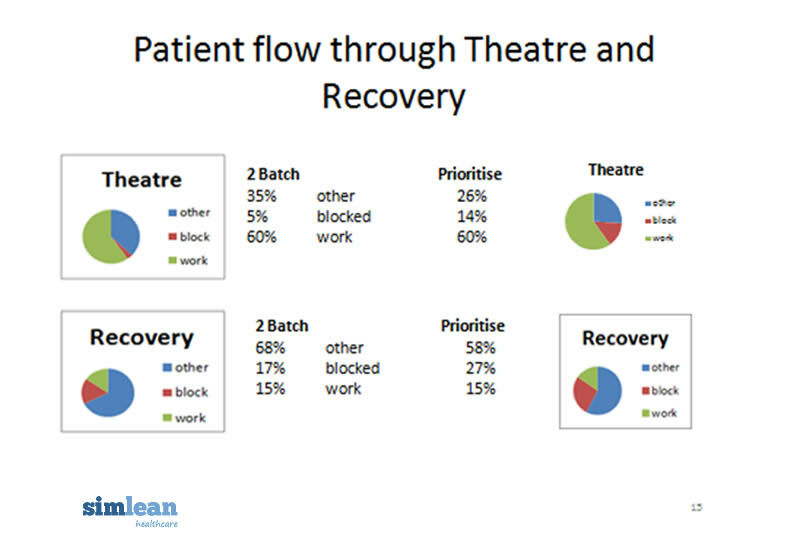 The final slide (slide 15), compares patient flow through theatre and recovery illustrating the increased blocks in theatre and recovery under the prioritised system. In summary, the patient experience is poor for patients who are not prioritised; patient flow is reduced, waiting times are longer, overall throughput times are longer and thus the likely knock-on effect is that staff are also working harder for longer. The session should conclude with a discussion around why the prioritised system has produced a poorer overall experience for patients. Is it because the system is not set up to cope with the surge in demand created by pushing prioritised patients to the front? If so, what can be done to balance the system to improve patient flow for all patients rather than just a prioritised few? In a busy hospital environment the majority of staff are busy from the time they enter the workplace to the time they leave. Ironically, constant busyness can sometimes mean that patient needs (value adding activity) can become neglected and/or delayed because value creating resources are reduced. There may be all sorts of reasons for reduced resource availability, and these may include persistent distraction from patients, relatives and staff; persistent phone calls asking for the availability of patient beds; staff sickness; lateness; excess paperwork and so on. Interlude 3 is designed to promote discussion around the impact of reduced resources on patient flow. Unlike interludes 1 and 2 we do not rely on data to evaluate the effectiveness of a process, here we use the model differently, emphasising the impact of resource scarcity visually through the simulated model to promote discussion. The slides that follow demonstrate that reduced resource availability has a severe impact upon patient flow and patient value. The underlying principle of Lean that is being demonstrated here is the need to match capacity to demand, making sure that the right resources are in the right place at the right time, without this the system's capability to deliver patient value is severely impaired. The first step is to run the 2 batch model and explain the resource configuration, notes are also available in the slides to remind you. In the '2 batch' model there are 6 nurses with specialist skills working from a central pool to look after patients in the Holding bay and in Recovery. The first available nurse will go to the patient who has been waiting longest – whether in Holding or Recovery. Note – this is a good way to organise resources as their flexibility is better than assigning a resource exclusively to one process (eg Recovery) as there may be times when there are no patients in Recovery but a queue for Holding. Run the model. As the model runs you will see that the Holding bays will fill up with 4 patients (and nurses) but none will have got to Recovery. As the session progresses the nurses will be needed in both Holding and Recovery as patients start to come out of Theatre. Often all 6 nurses will be with a patient and they stay with that patient until he/she can move to the next stage – even when their treatment is complete but their exit blocked. Figure 6 illustrates the process at 9.45 am – 1 hour and 45 minutes into the morning session. All 6 nurses are busy as indicated by the zero above the head of the image in the nurses' station. Three nurses are with patients in the holding bay, 2 of the patients are ready to go to Theatre but the theatres are full so they are blocking the progress of patients from Holding to Theatre. Of the 3 patients in Recovery only one is ready to move on and must be waiting to be admitted to the wards. The nurses are available to the Theatre process 100% of the time (they are replaced by another nurse when it's time for their break) and for this situation the results from the simulation give the latest time for someone to leave. This is 3 hrs 54 mins (234 mins) i.e just before 12 noon for a morning session and just before 5pm for an afternoon session. However, the last patient leaves Recovery after 4hrs 28 mins (288mins) – over 30 mins after Theatre has finished as the nurses have to wait until their patient has entered the Admission or Discharge process. Now let's consider the addition of interruptions that are reducing the availability of nurses in the Theatre process by 10% and the average time that they are away is 5 minutes (roughly equivalent to an absence of 5 minutes an hour). Figure 7 presents a screenshot of the simulated model at 10.15am. At this point there are only 5 nurses (4 in the Holding bay and 1 in Recovery) and all patients are ready to move on but none can move until the nurse returns or the patient completes their Admission to the Ward. As you might expect, patients experience longer waiting times and blockages as resources become depleted. But just how far can resource availability deplete before the system breaks? Slide 5 helps us to answer this question. The results of patient throughput are measured by the longest time spent in the process by any one patient. For 100%, 90%, 80% and 70% resource (nurse) availability. We can see that with 90% availability the amount of time spent in the system is considerably longer causing the morning session to over-run into the afternoon session and the afternoon session to run late. When depleted further to 80% the situation grows worse. Remember, 80% availability could be a consequence of nurses being distracted for approximately 10 minutes in every hour, not an inconceivable scenario. As resource is depleted further to 70% the system breaks. The model records the last person leaving the recovery bay after 40 hours and 45 minutes in the system. The 70% scenario can be run from the 3rd model to show the impact of 70% resource availability. Figure 8 presents a screenshot of the process at 8.15pm. Notice the queues in arrivals, and the wait area as the system simply cannot process the patients. One would hope that this scenario would never happen in practice, but it certainly could. Our models have clearly shown a dramatic reduction in patient value in line with a reasonably small reduction in resource availability. Remember just 10 minutes unplanned activity out of an hour will considerably affect the flow. The purpose of this illustration is to provide a catalyst for a discussion around what might cause resources to be depleted. This is often a sensitive issue but the model should provide the necessary consensus around the need to change given the impact of the problem as suggested in the models. SimLean Facilitate is intended to be used as part of an improvement event or project. As SimLean Facilitate is intended to be integral to an improvement event we advise that careful attention is paid to the following set-up steps you would usually take when initiating the improvement activity/event. (In Lean jargon, this is your 'A3 planning'). Some discussion of the process steps and likely issues/suggestions for improvement prior to the event will be useful (although not necessary) in helping the modeller create a simulation model quickly. it is good practice to organise a meeting with the project champion/team leader (if there is one) to discuss how a model might be used to facilitate experimenting with a process. The better the modeller understands the process and the difficulties faced prior to the event, the better prepared they can be to create a model that is useful during the event. It is common practice for event participants to go and experience the process/pathway themselves during the event (even if they work there every day). The aim is to: collect information from the perspective of staff and patients about the process experience; identify each process step; collect data concerning the time needed to conduct the process step versus the actual time taken to complete that process step. If time and resources allow, it is often very useful to follow the patient through the pathway, collecting actual times about waiting and also to experience the process through the eyes of the patient. The facilitator should be reminded that whilst data gathering and input is very important it should not be an arduous task. Our experience is that it is better to use data collected by workshop participants that reflects what is considered to be the best, worst, and average times taken to complete each task rather than over-complicate this with complex analysis. The objective and strength of SimLean Facilitate is to indicate the probable impact of a process change very quickly, to model a process in detail can take several months if not weeks of a professional modeller's time. Once sufficient data is collected it is important that event participants collectively recreate the process in the normal way (known as process mapping or value stream mapping). Typically this involves using brown paper and post-it notes stretching across a wall (as shown in an earlier section, Figure 3a p.10). Once the process has been created it is now time for the modeller to create an imitation of the process using modelling software (we use SIMUL8). It is best to allow 1 to 2 days for this activity. Meanwhile, the improvement event should continue as planned (some hospitals conduct improvement events across 5 consecutive days, others stagger the event across a week or longer (participants return to their normal daily work between improvement days). In our experience, the scale and complexity of process mapping activity and the level of waste inherent in daily work can often result in participants feeling exhausted and disheartened. This is a good sign and a common feature of a 'normal' change curve. In our experience, a good mechanism for shaking participants out of the 'current state' mindset is to get them to design the process as if money was no object and resources were plentiful. This is a fun activity but it is often surprising just how much of the 'wishful thinking' is actually achievable. The patient was late in theatre, it caused a delay. Why? The original trolley's safety rail was worn and had eventually broken. Why? It had not been regularly checked for wear. Why? The root cause - there is no equipment maintenance schedule. Setting up a proper maintenance schedule helps ensure that patients should never again be late due to faulty equipment. This reduces delays and improves flow. If you simply repair the trolley or do a one-off safety rail check, the problem may happen again sometime in the future. Participants should now start thinking critically about the non-value adding activity they have identified in the process and conducting root cause analysis work in small groups to understand why the problem is occurring. Good tools to get down to the root cause include '5-why' analysis and using the 'Fishbone' diagram (also known as a cause and effect diagram). An example of '5 why' analysis is presented in the side bar. For instructions about how to use the fishbone diagram go to www.institute.nhs.uk and click on the service improvement tools. It may be appropriate to call upon other members of staff to help understand the root cause of waste and inefficiencies better and to get their buy-in. In one hospital, the executive board meets half way through the 'improvement week' to talk about the issues identified and consider whether any extra leverage is needed to help changes get implemented. Often these are issues surrounding the movement of resources and plugs for instance which can sometimes block change, other times it may be about changing rooms or implementing new standards and policy and this is where involvement of the Executive board can really be useful. Whilst participants are busy critically reflecting on the current process and considering how it can be improved, the model is being developed in simulation software. SimLean Facilitate is designed to give a quick 'indication' of the probable impact of a process change. To build the simulation rapidly we model process times with estimated data using triangular distributions and route patients according to their type or by percentages. The model demonstration is a point of validation in one respect, making sure that participants agree with the configuration of the process and the process flows. Importantly however, this validation exercise is really a mechanism for engaging participants in challenging the process. In our experience, participants either begin by acknowledging the process as their own and acknowledging the (over) complexity of it, alternatively, they may challenge the model and in turn challenge their process and consequently the way they do things (this should be the aim of Lean activity, to encourage people to think differently about the best way to do work in order to stimulate improvement and hopefully continuous improvement). Step 5 - Conduct a rapid experiment to test 'what if'. Figure 9a above is an example of a process map created to imitate the flow of patients and resources (nurses and doctors) through a paediatric assessment unit. In this example, participants were struck by the complexity of patient flow and resource flow. One of the potential improvements they were considering was to 'protect a bed' for a particular kind of patient. In this example the nurses felt that to protect a bed would cause chaos in the unit and starve it of resources. As a 'rapid-experiment' the modeller was able to imitate the impact of 'protecting a bed' and showed that it wouldn't create the chaos the nurses had expected. Based on this evidence, it was agreed to trial the 'protect a bed' solution on the ward for a three week period. The model had given them a consensus of confidence to facilitate testing the idea in the paediatric assessment unit. NB: The time taken to reconfigure the model to imitate a process change will vary according to the skill and experience of the modeller and the complexity of the proposed change. An experienced modeller will be able to do this within 1 hour, a less experienced modeller may wish to make the change overnight. Once the model has been modified to reflect the process change, the modeller should repeat step 4, demonstrating and validating the model with the participants. Again this should stimulate discussion around 'is this what happens?' Is this what we thought would happen? Is it better/worse and then hopefully, how can we make this change happen? Thereby SimLean Facilitate places the process in the hands of the participants who can experiment with different process changes to examine the impact. See Case Vignette 2 for an example of how a model created in this way facilitated discussion around how to improve a process. In this example, prior to the development of the model the improvement participants were satisfied with the way that the process was conducted and did not feel that the process needed improving (despite excessive waiting times for patients). However, after the model was shown the participants engaged in a far more positive discussion about what changes could be made. The ophthalmology department in a teaching hospital in the North West of England was suffering from very poor nursing morale. The department was performing well under the national performance measures but doctors were customarily turning up 1.5 hours late for their 3 hour clinics. This resulted in waiting rooms full of patients whose waiting times varied from 10 minutes to 2 and half hours. One improvement participant sat with a patient to measure the amount of time spent waiting and the amount of time being 'seen to'. The participant found that only 12 minutes of the 2.5 hour wait was the patient actually being seen to. These 12 minutes were divided across 3 separate staff. As some doctors were turning up late, the nurses were forced to stay behind with the benefit of being able to take time off in lieu (which they couldn't take of course as they were always busy or covering for staff off sick). In addition these nurses were constantly interrupted by frustrated patients wondering why they were waiting so long. Other patients seemed to accept the prospect of a long wait and bring along books, flasks of hot tea and sandwiches; other patients (often parents with young children) would give up and leave. During a two day improvement event, the nurses came together feeling panicked by the prospect of taking time away from a busy department and regarding the exercise as hopeless when everyone knows that the process is working fine it's just the doctors who are turning up late! At the end of day 1 little had changed. Two days later, day 2 of the improvement event took place and a model of the current process as defined by the participants was demonstrated. The mood changed. The model provided the nurses with an opportunity to look at the process configuration from the 'outside'. Prior to the model there was a very clear perception that every patient was different, that they did not know what each patient required until they walked through the door. The model blew this myth. All patients had a similar pathway and the pathway was largely known prior to the patient's arrival. At this point, mindsets changed, the participants started to think 'what if', thereby forgetting the constraints of doctors who limit the process with their lateness but actually thinking about changes they could make to the process which would result in more value to the patient, less chaos in the department and eventually when doctors do start turning up on time, better morale for the staff. The authors would like to acknowledge the support provided by the Warwick IMRC under grant number R.IBOP.9229+R.ESWM.9229+R.MHPC.9229: 'SLIM' that allowed us to do the basic research, design and then trial the SimLean concepts in a range of NHS hospital trusts. Thanks also go to the Steering Committee who guided and supported us over the three years that the SLIM project ran.